Is there a better alternative to English&Fun? Is English&Fun really the best app in Language category? Will English&Fun work good on macOS 10.13.4? English&Fun is an application designed to improve one’s listening - and comprehension - level. It focuses on functions usefull especially to users whose mother language is not English. Actually, with the variety of system-voices available nowadays, the app --besides English-- may be successfully used to improve one’s listening- and comprehension-level in other languages as well. Voices can be quickly set in the Control Palette. Speed-reading: stage may be varied to suit the user’s comprehension level (beginner, advanced, proficient), as shown in the screenshots. English&Fun needs a review. Be the first to review this app and get the discussion started! English&Fun needs a rating. Be the first to rate this app and get the discussion started! Option to highlight each word of the text while being read. A text, or part of it, can be read in a loop (i.e. several times). Basic spelling- and grammar-checkers, and printing functions too available. 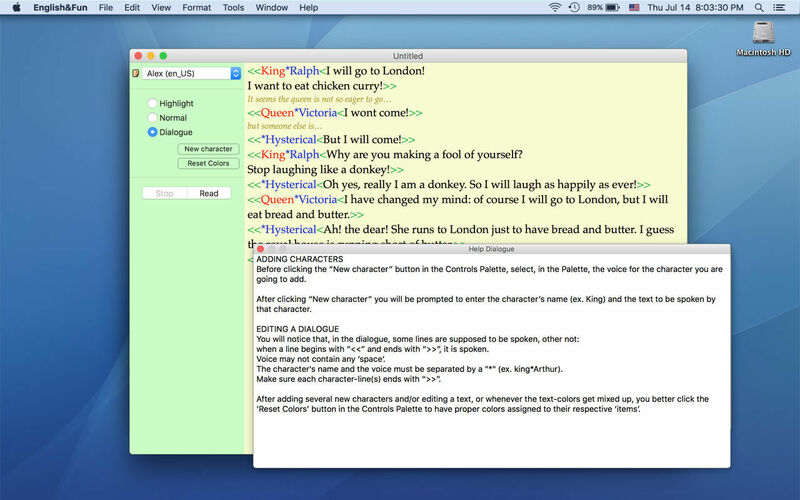 And for the creative user, there is a tutorial showing how to write a play (i.e. a text with different voices) and listen to it (see Screenshot 1). Limitations: one document at a time. That is: before accessing a different document, the current document has to be closed.